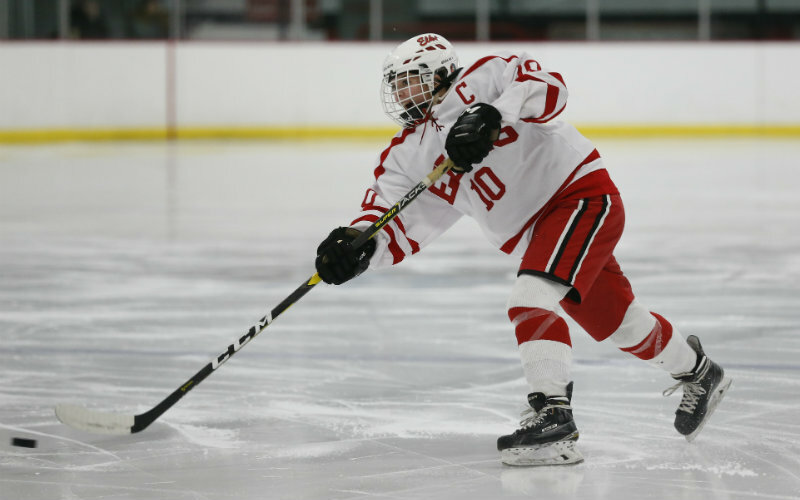 Semifinalists for the 2019 Ms. Hockey award were unveiled by Let’s Play Hockey, and the list includes this season's leading scorer and teammates from multiple teams. The winner, who is deemed the best high school senior in Minnesota, will be announced in February. In total, seven forwards and three defenders made the semifinalist list, with Hill-Murray, Blake and Edina each garnering two honorees. The 10 semifinalists are: Kelsey King of Elk River; Izzy Daniel and Madeline Wethington of Blake; Haylee Blinkhorn and Katie Kaufman of Hill-Murray; CC Bowlby and Mallory Uihlein of Edina; Kaitlyn Kotlowski of Warroad; Mannon McMahon of Maple Grove; and Sadie Peart of Grand Rapids/Greenway. King, a Minnesota State Mankato commit, headlines the list as the state’s top goal scorer throughout most of the regular season. Through Jan. 30, she’s tallied 40 goals and 20 assists en route to powering the Elks to a 14-6-3 overall record. Nine of her goals have come on the power play and six were shorthanded. Daniel and Wethington have helped Blake to a 20-2 overall record and the top ranking in the Class 2A coaches’ poll, while Bowlby and Uihlein have guided the No. 2-2A Hornets to a 19-4 record. Blake and Edina, which are Section 6 foes, split their regular-season series this year. Daniel, second in points for the Bears with 22 goals and 26 assists (48 points), and Wethington each had an assist in their team’s 2-1 win over Edina on Jan. 18. Blinkhorn and Kaufman have steered Hill-Murray to an undefeated record in Metro East Conference play and have been key in helping the No. 10-2A Pioneers avoid more than one loss in 2019. Kaufman leads the team in points (51) with 26 goals and 25 assists, while Blinkhorn has 39 points (15 goals, 24 assists). Each semifinalist has committed to playing for a Division I collegiate program next fall, with three choosing to stay in the State of Hockey and five playing in the Western Collegiate Hockey Association (WCHA). Last year’s winner, Taylor Heise of Red Wing, is playing her freshman season for the University of Minnesota. Selected this season’s WCHA preseason Rookie of the Year, Heise, a forward, has averaged a point a game as she's tallied 11 goals and 17 assists through 28 games played. View the table below to see more about the honorees. In addition to on-ice performance, Let’s Play Hockey cites academics, coachability, citizenship, extracurricular and community activities for criteria that impacts who’s selected Ms. Hockey. The list will be pruned to five finalists who will be announced on Feb. 14. The winner will be honored on Sunday, Feb. 24 at the Ms. Hockey Awards Banquet at the St. Paul RiverCentre in downtown St. Paul. The award is sponsored by Let’s Play Hockey and the Minnesota Wild.